If you don’t fancy paying just under £100 for a classic Fred Perry cardigan (and everyone needs a cardigan in their wardrobe right now), check out a budget version instead – the Uniqlo lambswool V-neck cardigan. 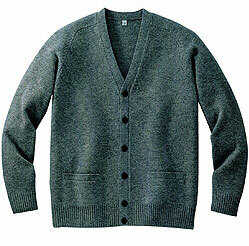 As the name suggests, this is pure lambswool, with a high V-neck, 6 black buttons and two front pockets. It’s available in four colours, including the grey pictured here and retails for a bargain £19.99 – which leaves you around £80 spare to spend in the sales! Thats a very nice looking V-neck cardigan, but it does have a vaguely “Mister Rogers” suggestion to it. The price isn’t bad though, and the quality looks very nice.